Polenta is one of my favorite side dishes, and far more simple than a lot of people think. In this recipe video, I make a simple and tasty polenta that would go great as a side dish for roast chicken, braised dishes like oso bucco, or simple classic dishes like chicken piccata. Polenta is just ground corn, essentially the same as grits, and once you can make one, you can make the other. Being an Italian preparation, I like to make my basic polenta with some parmesan cheese mixed in. 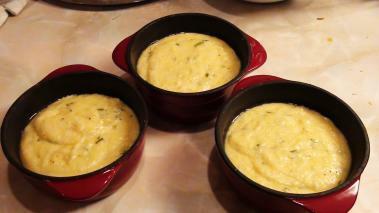 You can also add other ingredients either mixed in with the polenta, or garnished on top. Either way you’ll end up with a great dish. Use enough water when cooking. Polenta will swell and thicken very quickly, and I usually find that I need a bit more water than the package tells me. Fortunately it’s easy to add more water as you go. Cook the polenta well. Similar to the amount of water, I find most packages under estimate the cooking time for polenta. I like soft, creamy polenta, and I generally find it takes about 40 minutes on low heat to get there – some packages may say 20 – 25 minutes. Gotta make sure you stir the polenta every 5 minutes or so. Although you’ll cook it over low heat, it does get very thick, very quickly. You can add some water if it starts to look like cement, but even then you need make the bottom is not sticking and burning..
After about 40 minutes taste the polenta. The grains should be firm, but easily give way to the tooth – like al dente pasta. If it’s hard, continue to cook. Polenta makes a great alternative to some of the more “traditional” starches like mashed potatoes, rice and pasta. And it’s really easy to change up the style by adding other ingredients like sautéed mushrooms, broccoli, bacon, or just about anything else. How do I prevent my orange flavoured polenta cake from becoming rock hard after baking it in the oven?